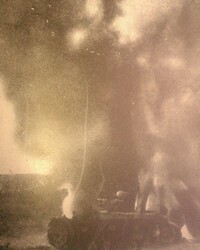 This year is the critical turning point of the war. 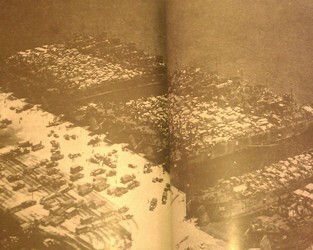 Unlike the earlier years, there was reason for optimism despite enormous casualties. 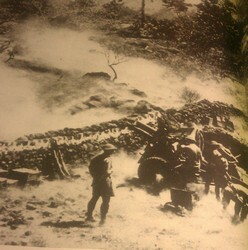 The resources of the United States and the training of its soldiers in the crucible of battle turned the fundamentals from defense to offense in both the European and Pacific theaters. 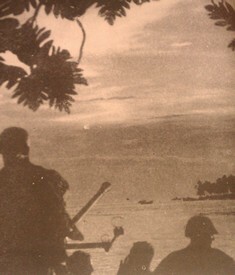 January 2: Allied forces capture Buna, New Guinea after 6 week battle, and many Japanese died on the invasion beach. 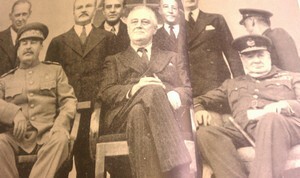 January 14: President Roosevelt and P.M. Churchill meet at Casablanca and plan war strategy and agree to demand unconditional surrender from Germany. 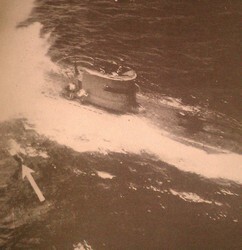 February: Survivors from torpedoed convoy ship in Atlantic Ocean. 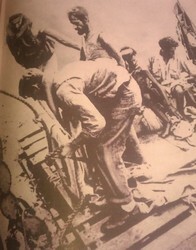 February 9: Americans mop up after 6 months of battles on Guadalcanal, Solomon Islands chain. 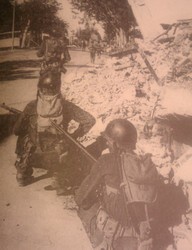 Japanese left alive have secretively evacuated the island. 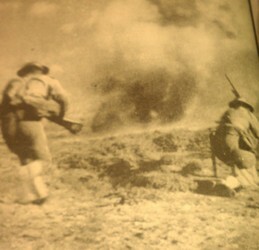 February 23: Shell scores direct hit on panzer in Tunisia as British troops repulse German attack and Germans lose at least 20 panzers. 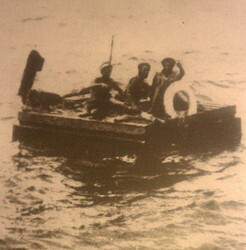 March: One American and two Dutch survivors of 83 days on raft floating on 2 oil cans after U-Boat attack. 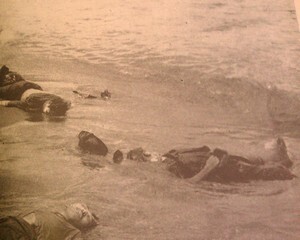 Two other men died and were buried at sea. 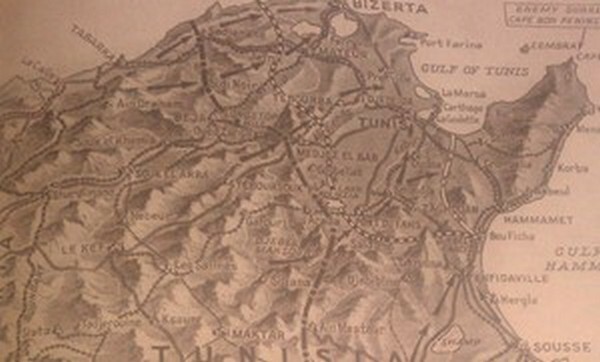 March 22-24: British 8th Army attacking in Wadi Zigzau and struggle to overcome rough terrain and strong enemy resistance in Tunisia. 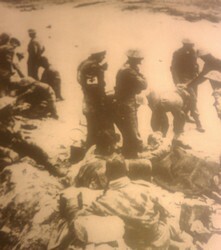 May 12: Trapped German forces (upper right corner) surrender at Cape Bon. 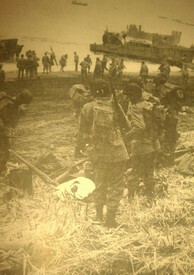 May : American forces land on Attu Island in Aleutian chain to recover several islands occupied by Japanese since June 1942. 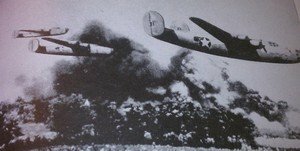 It takes the balance of the month to clear the Japanese fighters. 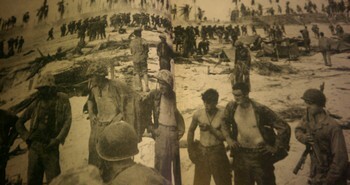 June : Japanese prisoners captured on Guadalcanal. 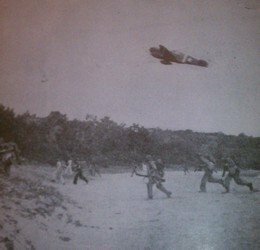 June: P-40 flew cover for U.S. infantry landing at Rendova in Solomon Islands chain. 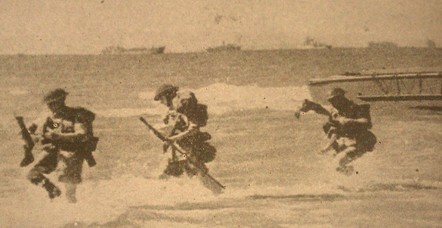 June 22: Invasion force in North Africa readies itself for Sicily invasion. 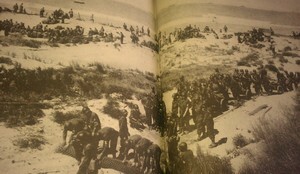 June 30: As seen from the shore, Marines land unscathed on Rendova (New George chain), but battle will begin shortly. 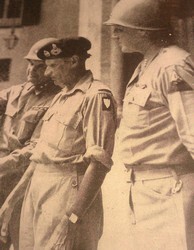 July 9-10: Allies invade Sicily--- British attacking beachhead and join Canadians on shore. 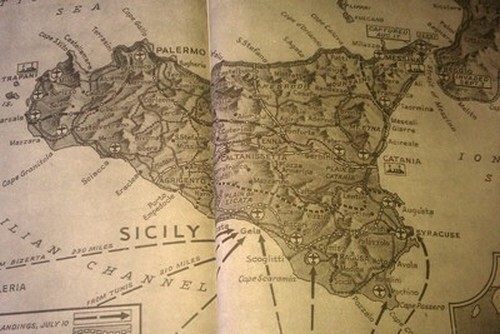 July: Not so friendly generals, Montgomery and Patton, view map of Sicily. 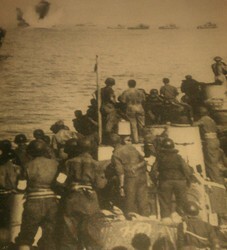 July: U.S. troops land on Sicily's west coast. 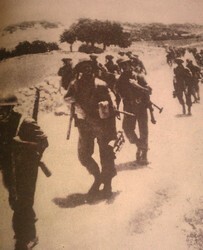 July: British wounded evacuated from Syracuse, Sicily after encountering heavy fighting. 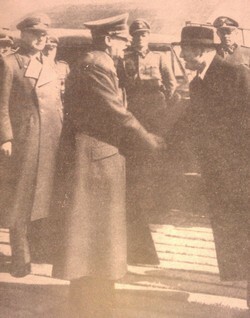 July 25: Mussolini forced to resign by Fascist General Council. 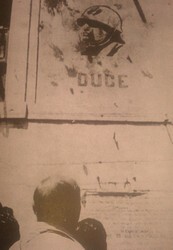 His picture pelted with fruit by Italians. 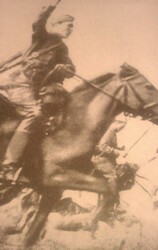 August 1: Cossack cavalry attack Germans in Caucus area. The old meets the new. 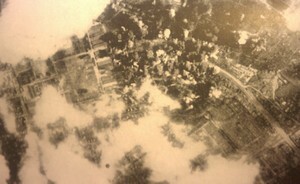 August 1: Liberator bombers attack Romanian oil fields. 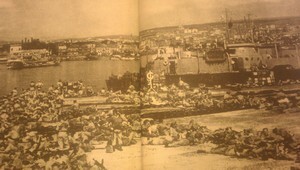 August 17: Americans enter Messina and Sicily falls. 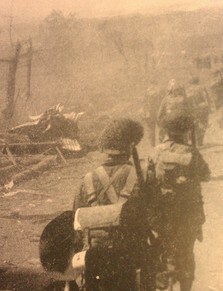 Final British assault. 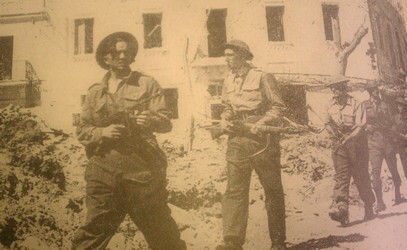 September 2: Fourth year of war ends and British gather invasion force for Italian mainland. 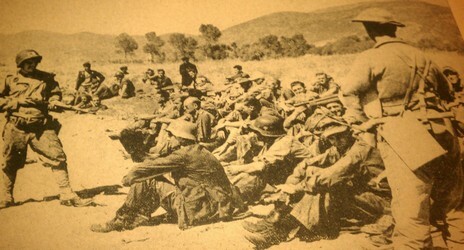 September 9: U.S. 5th Army prepares for invasion on Italian mainland at Salerno and capture first German soldiers on beachhead. 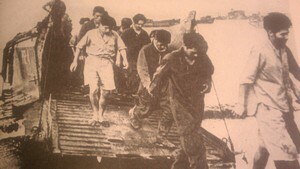 September: Mussolini is rescued by German paratroopers from Italian imprisonment. 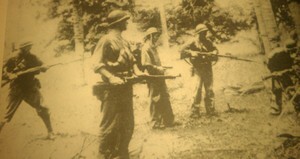 September 18: U.S. surprise Japanese main base at Lae, New Guinea. 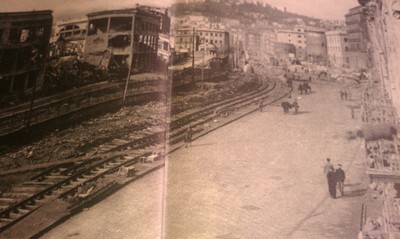 October 1: Allies capture Naples. 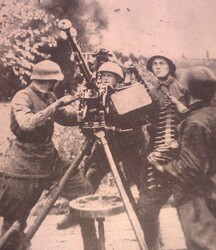 October 2: Soviets use aerial machine gun, but note attention of one of the crew fastened on a nearby explosion. 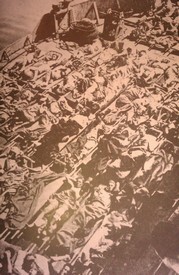 November 24: Marines suffer heavy casualties on Tarawa. 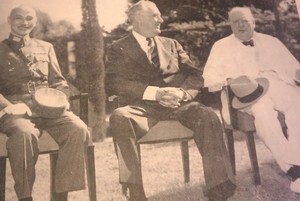 November 23: Cairo conference President Roosevelt, P.M. Churchill, and Generalissimo Chiang Kai-shek. 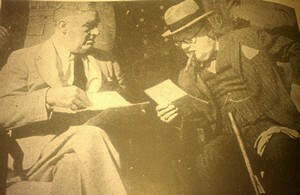 November 28: The familiar cast of characters. 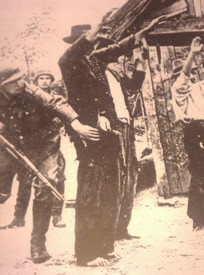 December 13: Tito's Yugoslavian partisans searched by Germans. 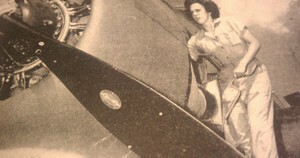 December: Breaking barriers: Aviation mechanic works on Grumman Avenger. December 16: British level Berlin again.